The Peace and Freedom Party supports Lee Chauser’s write-in campaign in the 33rd State Senate District. For information on voting for write-in candidates, see this article. For a map of her district, see the bottom of this page. The State of California is one of the richest states in the world, but the rich don’t pay their fair share, and we have some of the poorest people in the world living right beside the richest ones. The taxes that would fund education, welfare and health programs for all have not been paid by those who exploit the wealth of our state for their own personal use. Its time to stand the system on its head, tax the rich, and guarantee free education, healthcare, homes, and wealth for all citizens in the United States. Democrats and Republicans have not been able to make a real change. Real change involves taking the wealth of the rich few and putting to work for the people, instead of, those rich people who don’t really need it. We must fund educational institution, healthcare, and housing for the people of California. People should have these basic needs paid for by the State of California and the Federal government. We need to make the richest one-percent pay for these things. Write-in: Lee Chauser for State Senate 33rd District. I have worked as a teacher for twenty years. I have attended colleges and universities since 1963. I know the public school system and the California State University system very well. That’s why it breaks my heart to see it being torn apart by the crises that Capitalism has wrought on these institutions. Parents, students and citizens must come to the aide of these prized institutions to insure racial and gender equality. As an advanced industrial nation we need trained educators. 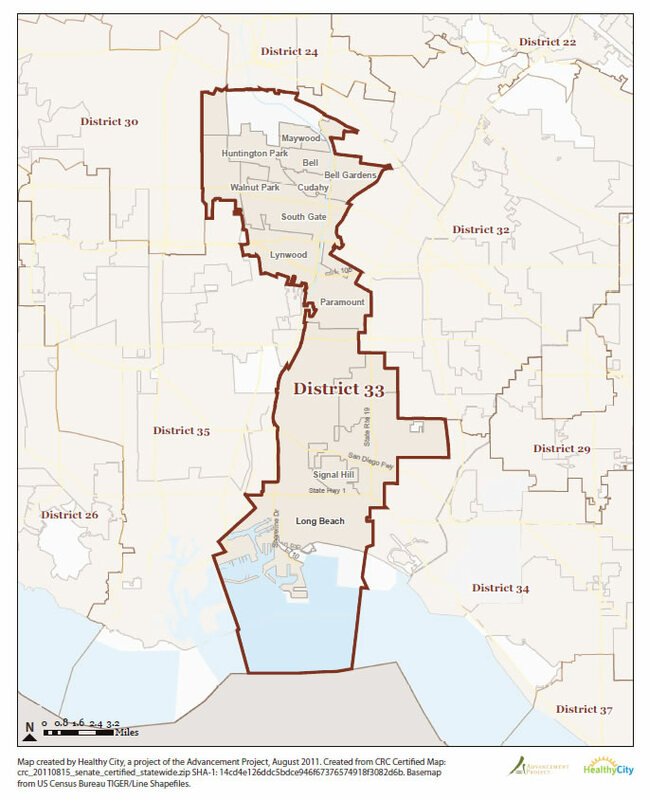 The 33rd Senate District is located entirely in Los Angeles County and includes all or part of Huntington Park, Maywood, Bell, Bell Gardens, Cudahy, Walnut Park, Southgate, Lynwood, Paramount, Signal Hill and Long Beach. For a more detailed map that you can zoom in on, click here. For a larger image of this map, click here.